In the dead-flat desert of northwestern Utah, archaeologists have uncovered a scene from a distant, and more verdant, time. 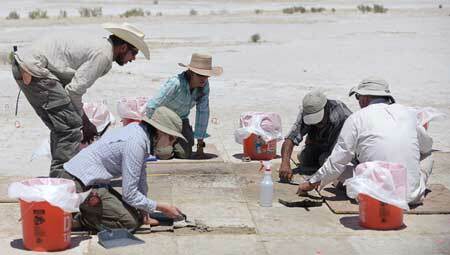 Just a few centimeters below the sun-baked surface, researchers have discovered a campsite used by prehistoric hunter-gatherers 12,300 years ago — when Utah’s West Desert was lush wetland. Artifacts found at the site include the charred remains of an ancient hearth, a finely crafted spear point, and, most surprising, a collection of tobacco seeds — likely the earliest evidence of tobacco use ever found in North America. “What makes this interesting is there’s no direct evidence of anybody using tobacco past 3,000 years ago,” said Dr. Daron Duke, senior archaeologist with the Nevada-based Far Western Anthropological Research Group, in a press statement. Duke and his colleagues made the find in the remote reaches of U.S. Air Force’s Utah Test and Training Range, a proving grounds in the salt flats west of Salt Lake City. The Air Force contracted with Duke’s firm in 2015 to survey thousands of acres of the range that had never been explored before by archaeologists. After finding a scattering of artifacts near the surface, the team returned this summer to excavate. “In the first week, we have collected over 60 items around the feature,” said Sarah Rice, Far Western senior archaeologist, referring to the hearth. In addition to the spear tip and seeds, the researchers have found many stone flakes left over from the tool-making process, as well as the broken bones of ducks and geese — trash left behind by hungry Ice Age hunters. “In this location, we see possibly a more generalized diet of several species of ducks, which is not surprising [for people] working and living in a wetland,” said D. Craig Young, a senior geoarchaeologist with Far Western. The spear point that the team discovered is 8 to 10 centimeters long, and seems to be over-engineered for hunting birds, Young said. “One wouldn’t think that was being used to capture ducks,” Young observed. Indeed, the campsite is not far from another striking find that Duke and his colleagues made a few years ago. 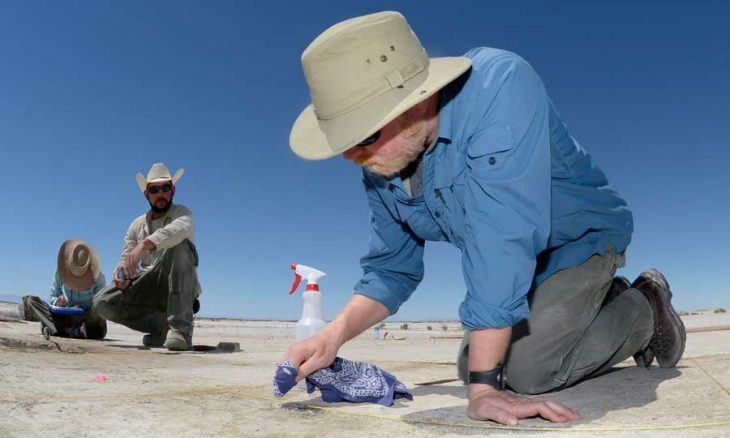 Those tools, like the newly found campsite, date to a time when the Ice Age-climate made the West Desert almost unrecognizable to modern eyes, Duke said. “The Great Basin is now arid, but at that time it was maybe 10 to 15 degrees cooler on average, a much cooler environment,” he said. In fact, a dark layer of sediment is still visible in the area, where marshy organic matter had been compressed into a sort of mat, which is still rich with the remains of plants, fowl, and fish. 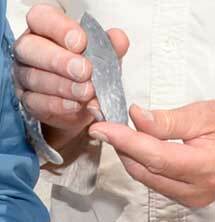 It was this layer, referred to as a “black mat,” that provided the radiocarbon date of 12,300 years. The people who lived and worked in this fecund environment were some of the first known inhabitants of the Great Basin, Duke said. “There are questions about the significance of these people,” Duke said. But as the climate changed at the end of the last Ice Age, so too, did the lifeways of the people who once used this campsite. “These people had a unique landscape for thousands of years,” Duke added. Exactly where these ancient hunters moved to, and who they became, remains a mystery. And so does the provenance of those tobacco seeds. 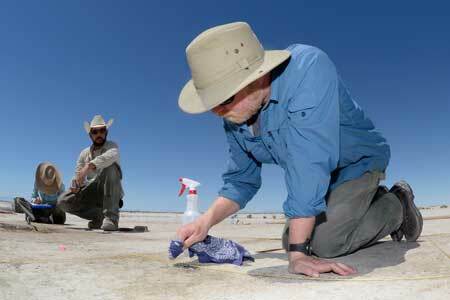 But places like the Utah Test and Training Range are likely rife with more, and similar, Ice Age sites. More research in places like this can yield new, important signs of life from the distant, hard-to-imagine past, the researchers noted. Several ideas regarding tobacco: the leaves could have been burned as smudge pots to reduce insect infestation during smoking of meats; to flavor or cure drying meats; to drive biting insects away in general; or as a ceremonial offering. I’m not sure if our predecessors were actually ingesting this plant at this early period. I am simply interested in archeology and have no formal education in this area…just curiosity! What an amazing discovery. what is it that makes tobacco unique? Nicotine, that’s what. There may be many possible reasons for people to want to grow tobacco, but to actually invent the concept of agriculture would want a compelling reason no? That is fascnating stuff Blake, thanks for posting. Am I correct in my assumption that this particular haskett point example is the oldest one? This site is very significant, not only for the tobbaco seed find, but the fact that the haskett lithics are so old, much older than the related thick bodied lithics found in alaska, which lends weight to the notion that the haskett like lithics, such as sluiceway, agate basin and mesa among others, derive from much older tool complexes found in south america, such as el jobo from tiama tiama and monte verde, and represent a group of people moving north into north america. The tobacco find intrigues me, mainly because it is so ancient, and could help tie up some loose ends I have found in my recreational research, namely, how is it that plants native to north america found their way into the old world in ancient times. After reading your article on the finding of tobacco and datura at rock art sites, it made some connections that had not been appearant to me before. Datura is used for ceremonial purposes by Munda speaking people in northern india, these same people also share a mythological creation motif, the earth diver, with many native american cultrures. The most interesting part is that the species of datura used by the munda is most closely related to those found in the great basin. I have also read that prior the onset of the younger dryas, the people living along the inland lakes of nevada and western utah, didnt exploit waterfowl to any great extent, until after the onset of the YD, and it was only after the onset that the people of the great basin started to collect seeds, as a food source.